Creative visualisation is a technique using mental imagery and affirmation to achieve your personal and business goals. It has been widely used in many areas from health improvement, through to sport and business. A creative visualisation board is a tool you could use to clarify what you want in life and use it as a daily reminder of what is important to you, helping you to prioritise and giving you a much needed focus in a daily life. I’ve been using vision boards for years. Call me mad, but, in my opinion, they truly do work. It’s unlikely to be a magic trick. But, whilst creating them we invest lots of personal energy, so perhaps this is what makes them such a powerful self-developing tool. I’m also a big fan of creating them manually as, in my opinion, we are more likely to focus on our inner desires and goals. By asking ourselves questions about our personal life, relationships, career and our surroundings, we are clarifying in our heads what is important to us long-term and hence, what will make us happy. The vision boards are often a work in progress. You can remove images no longer appealing to you at any time, and you can keep adding stuff to it at any time. It’s yours, and no one can tell you what you want. I did my very first one in 2009 as a result of feeling stuck in a rut. I didn’t like my job, I wasn’t doing much outside work, and generally I was a pretty miserable person. Not good! 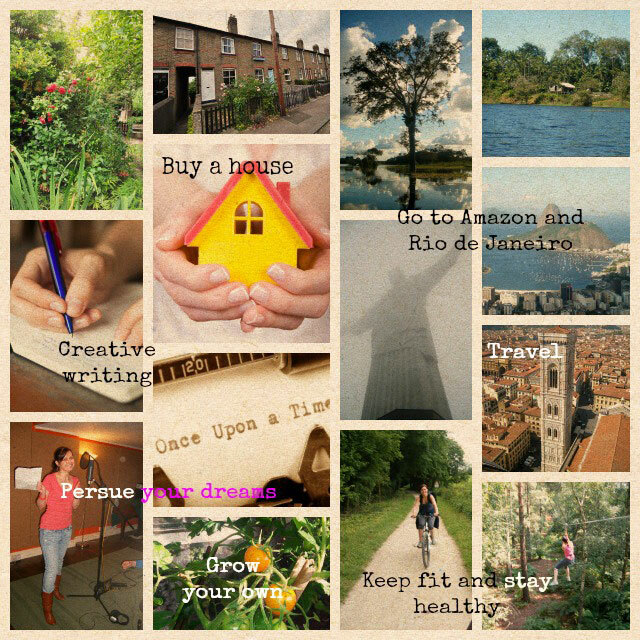 My first board included images (cut out from magazines and pictures printed from the internet) reflecting on what I wanted from my professional career at the time; where I wanted to travel to; where I wanted to live; what I wanted to do more of in my spare time and what type of person I wanted to be. Creating it was very therapeutic in itself! I’m not kidding you when I say that most of the things did become a reality. Just to give you few examples: I changed my job in 2010, went to Brazil (my dream destination), became a much healthier person, and bought my first house (all in 2011), which led to my first ever blog and the platform where I can express myself creatively. Job done! Seriously, in retrospect, nothing could have worked out better. Was it magic, or simply that I kept reminding myself every day what I wanted? Since then, Pinterest was invented (definitely great idea, and I do use it as well), but I’m sticking with the traditional method. As soon as we moved to our first house, I went through numerous interior design magazines, and I created two boards that encapsulated how we wanted our first house to look like, and aid our design and DIY decisions. The board was invaluable in creating our first home. Last year, just before having our first baby (included on the board too.. haha), I created a new vision board reflecting another change in direction. My husband, a multi-media artist, and I were looking for a new creative project and wishing to adjust our lifestyle to welcome a new baby. We decided to set up PickArtHome, an online art shop offering a selection of unique, high quality, contemporary photographs for those seeking an out of the ordinary twist to their wall décor. Our new board is full of images encapsulating what our creative brand is about and how we want our life to be from now on. It’s positioned directly above our home office desk, so we both look at it daily. No excuses not to follow our dreams. Sit down somewhere quiet with a cup of tea or coffee, and write down or draw everything that comes to mind regarding yourself, your family, friends, a place to live, work, travel, etc. It might take you a while to get to the bottom of what you want, so just take your time and be completely honest with yourself. I personally love this part. To source your images, you can use old magazines, newspapers, postcards as well as the internet. Look for pictures, logos, words that represent your key themes. Cut them out or print them. Top tip: Create a folder to store your images and only keep those that you immediately associate with your personal and business desires. Spread your chosen images out. Get on the floor, if you like, and put them in piles: home, work, myself, my family etc. Get a cork board (mine is from IKEA), and using pins start pinning them down in your selected groups. 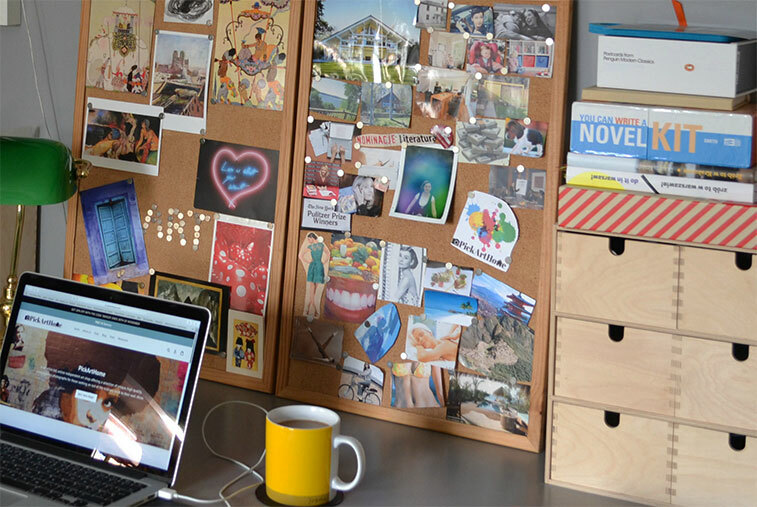 Ideally, position your board somewhere where you can see it every day. Also, feel free to take a picture of it on your phone. Top tip: Make sure you revisit your board at least once a month. Your goals might change, so don’t be afraid to amend your vision board accordingly. 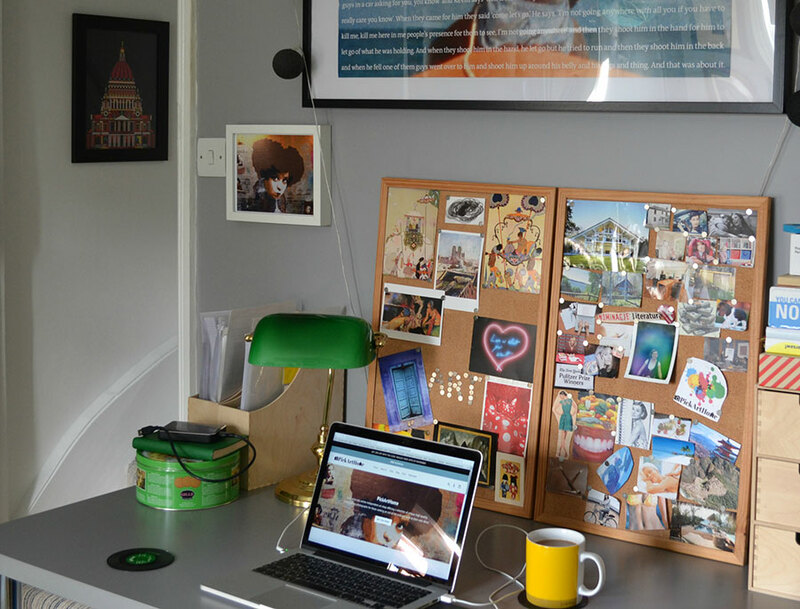 Are you sold on the idea of creating your own creative visualisation board? Have you done one before? If not, then get collecting those images and with a bit of luck and some visualisation maybe your dreams will come true, too. Shakti Gawain, Creative Visualization: Use the Power of Your Imagination to Create What You Want in Your Life. Esther and Jerry Hicks, The Law Of Attraction: How to Make It Work For You. You can find Monika at PickArtHome. Want to be part of a group of like-minded creatives that are going through what you’re going through? We have an amazing community of emerging designers, interior designers, stylists, fashion accessory brands, artists and photographers, where we help each other to grow. This is where I encourage sharing knowledge and brand collaborations. No fakes, self-interest liars and backstabbers are allowed. Please join us here. And, feel free to share if you found this useful!